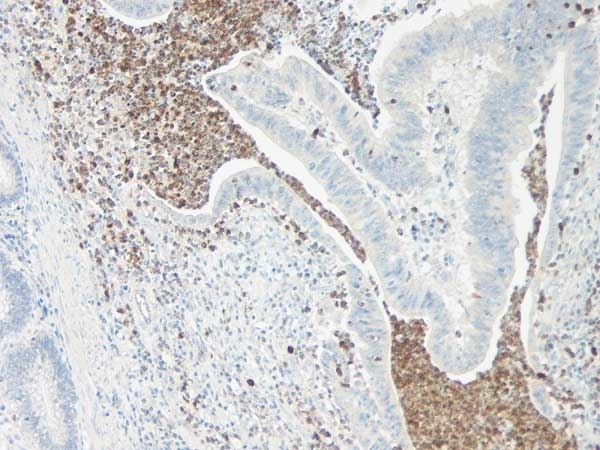 Rabbit anti Human Interleukin-5 antibody recognizes human IL-5 (Interleukin-5), a disulphide-linked homodimer consisting of two 115 amino acid chains, which is homologous to mouse eosinophil differentiation factor (EDF) and is produced by mast cells, eosinophils and T cells. IL-5 is a lineage-specific cytokine involved in the development and stimulation of eosinophils, and has been linked with diseases involving abnormally high levels of eosinophils, including parasitic infections and allergic airways eosinophilia, the major pathological symptom of allergic asthma. Antisera to human IL-5 were raised by repeated immunisations of rabbits with highly purified antigen. Purified IgG prepared by affinity chromatography. This antibody may be used in a direct ELISA or as the detection reagent in a sandwich ELISA with AHP1034 as the capture antibody. Campbell, H.D. et al. (1987) Molecular cloning, nucleotide sequence, and expression of the gene encoding human eosinophil differentiation factor (interleukin 5). Proc Natl Acad Sci U S A. 84 (19): 6629-33. Wang, J. et al. (1998) Circulating, but not local lung, IL-5 is required for the development of antigen-induced airways eosinophilia. J Clin Invest. 102 (6): 1132-41.